Photo by Spencer Tucker, New York City Mayor’s Office Mayor Michael Bloomberg celebrated the work of his Center for Economic Opportunity in 2007, but in the years since poverty in New York has increased. 1 in 5 New Yorkers living below the poverty level. From The Gotham Gazette: New figures confirm that poverty is increasing in New York City. What is the city’s response? Budget cuts. 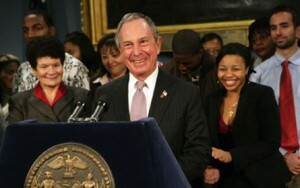 Less than two weeks after the U.S. Census Bureau reported that the city’s poverty rate jumped to 20.1 percent in calendar year 2010, Mayor Michael Bloomberg’s budget director demanded that all city agencies, including education and uniformed services, immediately plan to cut 2 percent for the remaining eight months of this fiscal year and 6 percent next year. Yet a series of reports make it clear that even without the latest round of cuts, poverty agencies — facing rising need and falling resources — cannot maintain services. In fact, the Mayor’s Management Report for fiscal year 2011, released in mid-September and not generally known for highlighting bad news is full of bad news. A companion report from the mayor’s Office of Contract Services and a new Independent Budget Office fiscal brief on children’s servicesprovide further evidence that the agencies can’t meet their stated goals.